Gidget Gabriela Benitez was born in Washington, D.C., and raised in Maryland and Florida. She graduated from the University of Central Florida with a B.S. in Psychology and Certificates in Criminal Profiling and Behavioral Forensics. In 2016, Gidget graduated from American University Washington College of Law, where she earned her Juris Doctor with a focus on intellectual property law. 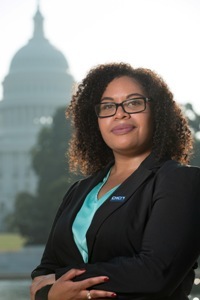 In her spare time, Gidget served the Hispanic Bar Association of DC as Co-Chair of the Student Affairs Committee and is currently a member of the Legislation and Policy Committee and Chair of the Diversity Report Committee. To address deficiencies in knowledge about scholarships for people of color, Gidget created “Afro LAWtina,” a podcast dedicated to answering frequently asked questions of African American and Latino pre-law and law students, sharing networking strategies and success during and after law school. Gidget’s passion for public service stems from her own experience as a homeless high school student raised by a single mother from the Caribbean islands. As a CHCI Law Graduate Fellow, she is eager to get hands-on experience in federal policymaking and develop the tools and professional experiences required to create national legislative change, while working on behalf of underserved communities.